Used by permission PleinAir Magazine, copyright 2004. Ray Roberts, Morning Light, Oil on Canvas, 30" x 40"
For me, painting is like driving to a new, exciting place. I have a vague sense of what it may be like but really no idea until I’m actually there. And when I get there, I’m always surprised at what I’ve “found” — something I didn't expect to turn out the way it did. This is just a sense I always get; it's not the reality of creating a painting. The single most important tool one needs for painting is drawing skill. With that and a set of paints, you're ready to go. When I paint a landscape on a clear day, I use one of my two approaches to painting. For this demonstration, I’ll use what I consider to be my “academic approach,” because it has everything to do with form and shadow. Back in high school, many of us took art classes drawing cones, spheres and cubes (yawn). What I didn’t know then was that, when drawing those cones, I was learning about light and shadow. And that that was how you created form in a drawing, which in turn makes things look real — hence the “light” in your artwork. 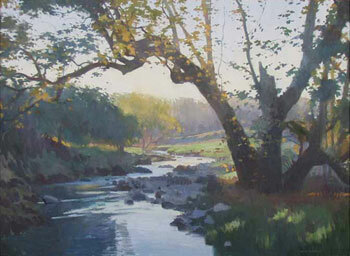 Ray Roberts, Curtis Creek, Oil on Panel, 16" x 20"
Deciding what to paint has always been one my biggest challenges. It always seems the grass is greener on the other side of that composition. Okay, back to Art 101. Start with a gesture sketch, right? Right. A basic line drawing will do. It’s like running off a diving board except — if I don’t like it — I can just start over. If it seems all right, I’ll just keep going. Next step for me would be the shadows, where I consider light source, local color and atmospheric perspective (among other things). Once the shadows are painted and I’ve established my composition, I fill in the rest of the painting, being very careful with my drawing, color and composition. Necessary to all honest painting is the experiential discovery and enlightenment of painting. It’s a process one goes through when creating a dimensional object with paint. That flicker of light is what I strive to see when I paint. 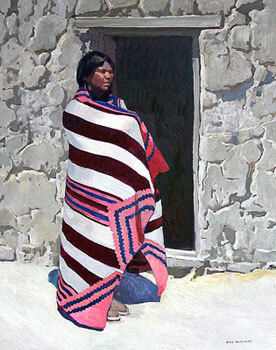 Ray Roberts, Desert Sentry, Oil on Panel, 12" x 16"
I was born in Santa Monica, California, in 1954. As a child, I spent hours drawing and had a lot of encouragement from friends and relatives. A neighbor across the street my childhood home was Evelyn Nunn Miller, who studied under Anna Hills of Laguna Beach fame. It seems a lot of art was created in my neighborhood. Following the premature death of my father, I was sent to Orme, a boarding school near Prescott, Arizona. It had a very strong fine-arts program, which continued to encourage me with my art. In 1978, I graduated from Art Center of College of Design in Los Angeles. I was not aware of how fortunate I had been to study under so many great artists, such as John Asaro, among others. Throughout my time there, all my electives were figure drawing and painting classes. Following studies at the Art Center, I immediately began freelancing as an illustrator in the Los Angeles area. Ray Roberts, Sycamore Creek, Oil on Canvas, 30" x 40"
In 1984, I again met Peggi Kroll, whom I had known at the Art Center, and we later married. We went to nightclubs to sketch people, we took night classes, and we painted. In 1985, we took an oil painting class from Dan McCaw. That same year, the first of our three children was born. Parenthood worked well for us with our careers in illustration. We were always home and were able to do a lot with the kids. With our young family, we moved to Scottsdale, Arizona, in December 1985. We continued with illustration, expanding our work nationally, with much of it coming from New York. 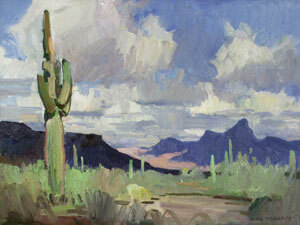 In 1989, we started taking workshops at the Scottsdale Artists School, where I soon began teaching. In addition, I took workshops from many of the finest painters available to me. From 1991 to 1994, I studied with many of the “Seven from Denver” and Harley Brown. I also took — as well as taught — portrait and landscape workshops. Ray Roberts, Goldfield Cliffs, Oil on Panel, 12" x 16"
Summers gave us the opportunity and excuse to leave the Valley of the Sun and head to cooler climates. We started participating in art festivals in Colorado and California and won several awards. Soon, art galleries approached both my wife and me for representation. 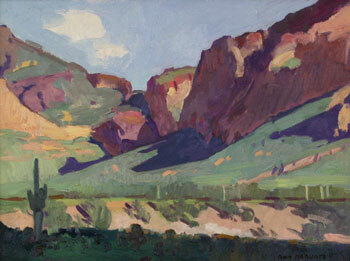 Some galleries participated in the Early California Art auctions and included my paintings. 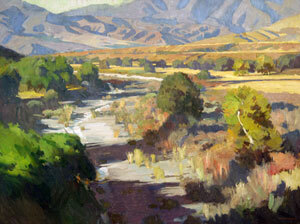 Although I loved to paint the desert, California landscapes seemed like such a magnet for me. The light, the coast, the lay of the land and the vegetation all spoke to me. In 1997, we moved back to California and settled in the gold-rush country. Angels Camp is small and quaint, and close to the scenes I love to paint. Since the move, I joined the California Art Club and started participating in their shows as well as other organizations’ shows. Peggi and I have enjoyed many two-person shows, and we continue to enjoy showing together, particularly in group shows. 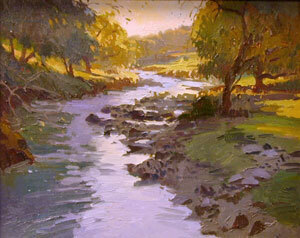 Ray Roberts, San Juan Creek, CA, Oil on Canvas, 30" x 40"
Plein-air painting in California seemed to hit during the mid ’90s, and there were lots of hungry painters wanting to learn how to paint outdoors. I’ve shared much of what I’ve learned with other artists through my workshops. In 2000, I joined Laguna Plein Air Painters Association, where I felt ties to my childhood and a homecoming of sorts. That same year, I was also a guest artist at the Northwest Rendezvous, a professional yet casual group of painters who have met for 25 years near Rocky Mount National Park in Montana. As a participant, I met, camped with and became better acquainted with the great artists who are members of that fine group. In 2002, during their awards ceremony, I was elected to join the group. In 2003, Plein Air Painters of America invited me to participate in its 18th Annual Show at Catalina Island. Three weeks later, George Strickland surprised me with a call, asking whether I wanted to be a member. These artist associations have in their ranks some of the greatest painters in America today; I am honored to be associated with them. I had no idea my life would play out like this. It's very busy, with many demands of family and career. I consider myself very lucky to have experienced everything I have in my life as an artist.